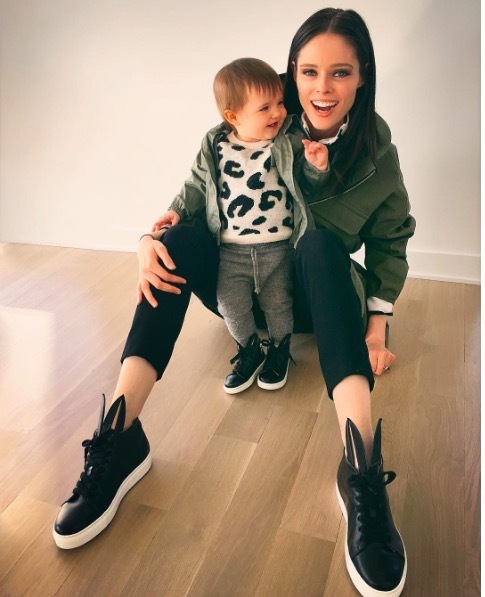 Coco Rocha sat down with People magazine to talk about motherhood while promoting her Co+Co Street Wear Collection Launch at RonRobinson in Santa Monica. The supermodel says because her husband James Conran manages her that they often bring their 1-year-old daughter Ioni to work. “It’s not necessarily every day like that, but it’s just the fact that I can do that — so I take that opportunity,” explains Rocha. Rocha understands that she is lucky to be able to spend so much time with her daughter. When it comes to parenting, the Canadian-native says she and her husband have a flexible schedule. “I think that the one thing people should do is just not have this repetition of a schedule,” she says. “Let things happen. I mean schedule bath time and night-night time and feeding time, but when it comes to moving around and you’re like, ‘Oh, I can’t leave the house it’s almost bath time.’ Let it loose a little and I think that that’s worked for us,” she explains. Meanwhile, Rocha says she can’t believe how fast her daughter is growing up. “I hate when people say, ‘Time flies.’ But it’s weird. Time flies,” she admits. “Eleven months she was walking. Ten months she was crawling and now she’s just starting to really [connect words] … It’s crazy,” she says. Rocha and Conran married in 2010. They welcomed their daughter last March.